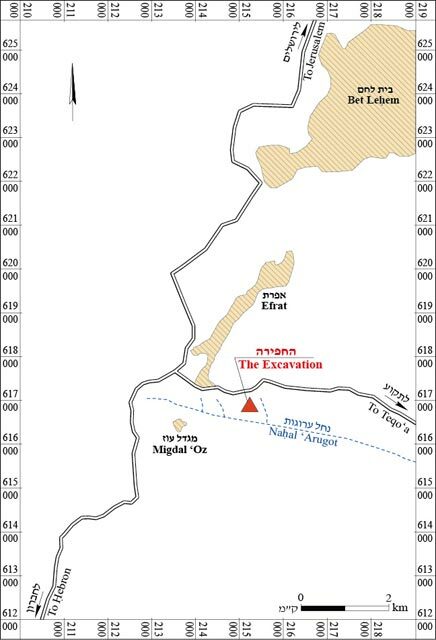 In March 2005, a salvage excavation was conducted c. 800 m southeast of Efrat (Judea and Samaria License No. 1033; map ref. 215120/617149; Fig. 1), prior to the establishment of a regional cemetery. The excavation, on behalf of the Archaeological Staff Officer of Judea and Samaria, was directed by E. Aharonovich, with the assistance of S. Batz (preliminary survey), P. Portonov (surveying), A. Harel (plans), H. Bitan (preparation of maps) and M. Manukian (drawing of finds). The excavation site is located in the Judean hills, on an exposed hilltop (c. 900 m asl) delimited on the east and south by tributaries of Nahal ‘Arugot. 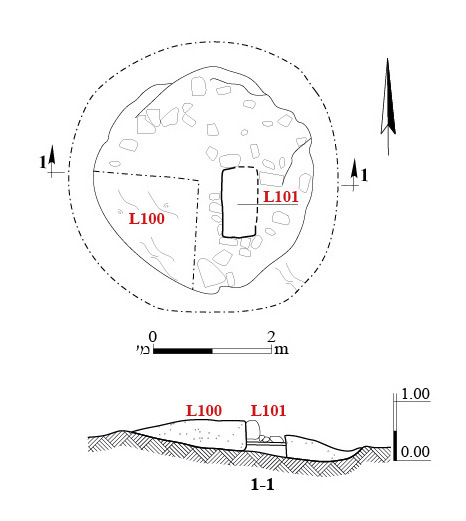 A cairn (L100) and a cave (L200) were excavated, two field walls were documented and four stone clearance heaps were examined (Fig. 2). Datable finds, ascribed to either the Iron Age III or the Persian period, were discovered only in the cairn. Cairn 100 (diam. 3.6 m; Fig. 3). The cairn was constructed without an outer perimeter wall. Within it was a rectangular burial cell (L101; 0.55 × 1.15 m) built on a fill of fieldstone and covered with another layer of fieldstones. Although the cell was devoid of finds, its dimensions seem to indicate it served for the burial of a child. A few pottery sherds, including a bowl and a base of a bowl, were found in the stone fill that was excavated around the burial cell. The bowl, which has a short, flat rim and a carinated body, is made of well-fired levigated clay and is decorated on the inside with reddish-brown and black stripes (Fig. 4:1). It belongs to a group of imported bowls adorned with painted strips (Banded Bowls) that is part of a larger repertoire known as Decorated Eastern-Greek and Cypriot Pottery, and are found at sites along the coastal plain. They first appeared in the late seventh–early sixth centuries BCE (Mezad Hashavyahu: Fantalkin 2001:74–75, Fig. 28:6 *), but were mainly prevalent in the Persian period (Tel Mikhal: Kapitaikin 2006:45, Fig. 12:9, 11, 12). 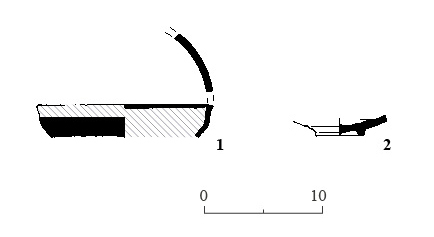 These bowls have a typical ring base similar to the one discovered in the excavation (Fig. 4:2). Cave 200 (3 × 3 m, height 1.1 m; Fig. 5) was a natural cave that was reached by way of two roughly hewn steps. Three non-diagnostic pottery sherds, with ribbing typical of the Early Roman or later periods, were discovered at the entrance to the cave. The cave’s interior was completely excavated, but no finds were discovered. The cave was probably used for brief periods of habitation or storage. Cairns similar to Cairn 100 were excavated on the southern fringes of the Judean Hills at Sansanna (Batz and Greenfeld 2009:188–191) and Tene ‘Omarim (Batz 2009:214–216), where they were dated to the Iron Age III. The cairns reflect the gradual infiltration of nomadic and semi-nomadic groups into areas that were devoid of permanent residents following Sennacherib’s campaign in 701 BCE (Batz 2006:71). This new population buried their dead in cairns, whose locations were selected at random. 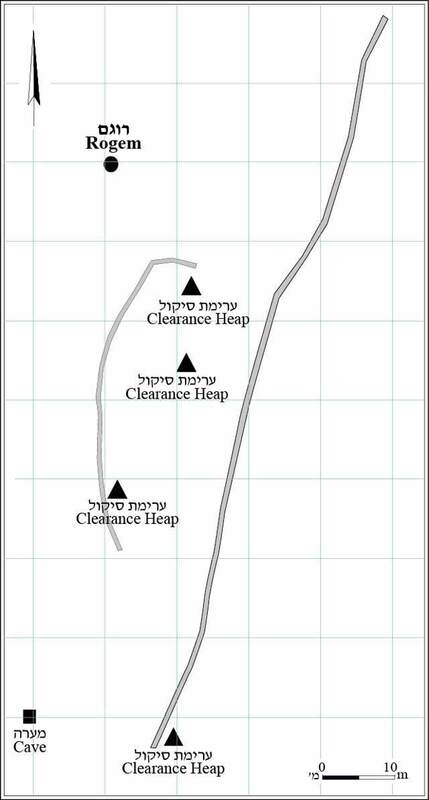 Thus, Cairn 100 should be added to the group of cairns excavated in the southern Hebron hills, indicating that their distribution extended to the north. The absence of any diagnostic finds associated with the cave, the field walls and the stone clearance heaps that were documented, precluded any precise dating. Batz S. 2006. The Region of the Southern Hebron Hills from the Period of the Iron Age II to the Persian Period in light of Recent Excavations. In Y. Eshel ed. Judea and Samaria Research Studies 16. Ariel. Pp. 55–72 (Hebrew). Batz S. 2009. Remains from the Iron Age II until the Byzantine Period in the Tene Omarim Quarry. In I. Yezerski ed. Excavations and Discoveries in Benjamin and Judea (JSP 10). Jerusalem. Pp. 213–224 (Hebrew; English summary, pp. 21*–22*). Batz S. and Greenfeld U. 2009. Remains at Sansanna from Iron Age IIB–III and the Byzantine and Late Islamic Periods. In I. Yezerski ed. Excavations and Discoveries in Benjamin and Judea (JSP 10). Jerusalem. Pp. 182–212 (Hebrew; English summary, pp. 18*–20*). Fantalkin A. 2001. Mezad Hashavyahu: Its Material Culture and Historical Background. Tel Aviv 28:1–165. Kapitaikin L.A. 2006. The Pottery from the IAA Excavations at Tel Mikhal (Tel Michal). ‘Atiqot 52:21–56. 3. Cairn 100, plan and section. 5. 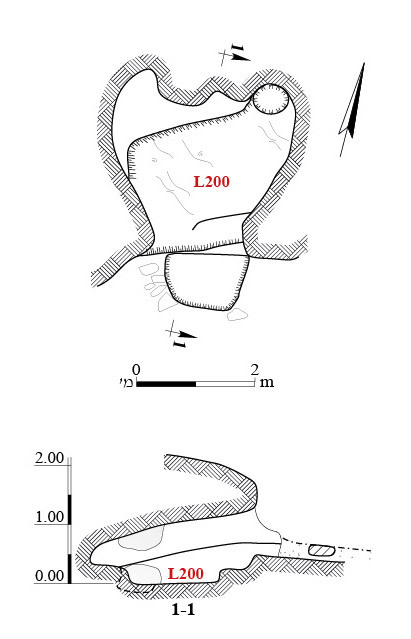 Cave 200, plan and section.